Newsbin Pro downloads headers and stores the data locally so that you can navigate them easily when looking through an individual newsgroup. These will need to be downloaded from your news server periodically in order to ensure that your newsreader has access to all of the latest articles. There are a number of ways for the client to accomplish this. A series of icons can be found just under the drop-down menu in Newsbin. The third icon from the left displays two arrows that are sort of pointed at each other in a circle. If you hover over this icon, you'll notice it says: Download All the Latest Group Updates. Simply pressing this button will allow Newsbin to update all of the news groups simultaneously. One caveat to using this option, however, is that it only performs an updates based on the time of the previous update. For instance, if when you installed Newsbin you only set it to retrieve 30 days worth of news, that will be the next jumping off point for updating. Most news servers support downloads that go significantly further back than that. If you want to setup Newsbin to retrieve files that have been posted in the past umpteen years, you'll need to familiarize yourself with one of the many windows available to you in the right-click menu of your newsreader. This feature lets you download all of the headers for usenet newsgroups going as far back as the retention on Usenet Storm allows. 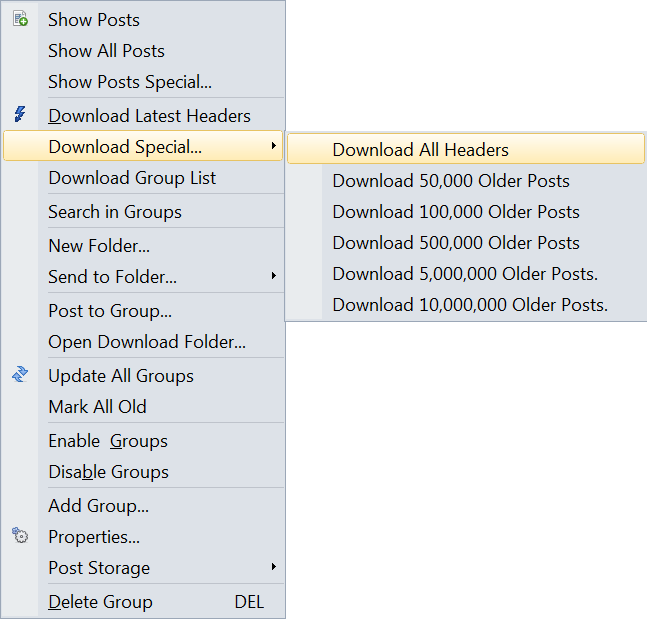 From there on out, you can simply load the latest headers from the group to your system by either updating or simply choosing the group. You should be warned, though, that some popular groups have 10's of billions or even 100's of billions of articles posted to them so choose newsgroups that aren't insanely large. If you get to a point where the Newsbin client does not appear to show the headers properly, there is a fix for that. There's an issue with how your news server has configured a special feature. Under the Options drop-down, selection Servers, the second choice from the top. In the lower right-hand area of the server's window, you'll find a button called Really Advanced. Click that button. Check the box that says Disable XFeatures and try to get the headers again. If this doesn't correct your problem, your best bet is to contact Newsbin's support crew. It should correct the issue for most users, however. If you do not see any posts in your newsgroups, Newsbin is probably loading all of the new posts based on a given setting. You can reload all of the downloaded headers by selecting the two arrows in a circle which is located next to the magnifying glass in the newsgroup window. This will load all the data going as far back as your Usenet news server allows. 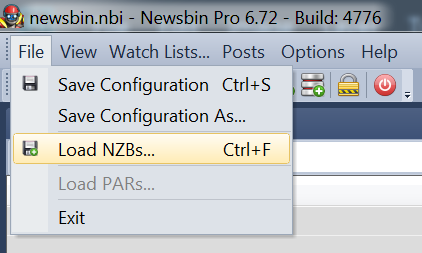 Newsbin can be used as an NZB client too! The only thing that it can't do is effectively act as an indexer. Indexers are paid services, but for a nominal yearly fee, you can get nearly unlimited access to billions of files going back a decade. There are also some popular free NZB sites, but you want to be careful with those. Paid services generally have quality standards and lack the annoying ads found on free sites. Needless to say, you need a source on the Internet to download NZB's. The news client software cannot help you with that. It can, on the other hand, actually help you locate and download files, using the NZB for location information. Next, you can simply load it into Newsbin from the File menu item on the drop-down. Newsbin will create a separate tab with the files that the NZB points to, as it contains information on where each file is located. They're less complex than torrents because they aren't responsible for connections or routing data. They only need to show the program where information is. The Newsbin program will create a folder that is named identically to whatever the tab’s title is, download to your system, and piece everything together again, just like a normal downloader would. 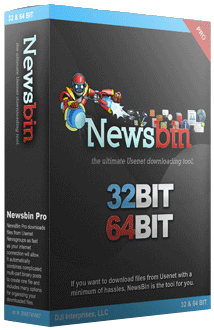 Like most popular newsreader software, Newsbin Pro comes with support for an almost unimaginable amount of settings and features to tinker with. While 90% of these can be ignored during setup, it's nonetheless better to know what they are and what they do in case you need them later. See Navigating Newsbin Pro for more information. Next, determine which folder will receive new downloads. Here, we're just going to run through your choices for settings. This section should help familiarize you with the awesome set of options that Newsbin affords its users. The first group controls how things are displayed. The second group controls the how thumbnail images are displayed. The third group controls how and when newsgroups are updated. Sets the interval at which searches are performed using watchlists. As would be expected, this frame directs how files are named once downloaded. Typically, Newsbin will simply use the title of the post to name the file or folder. In some instances, such as when the file name is very short, or an MP3, it will ask the user how to proceed. Here is where you can direct it. 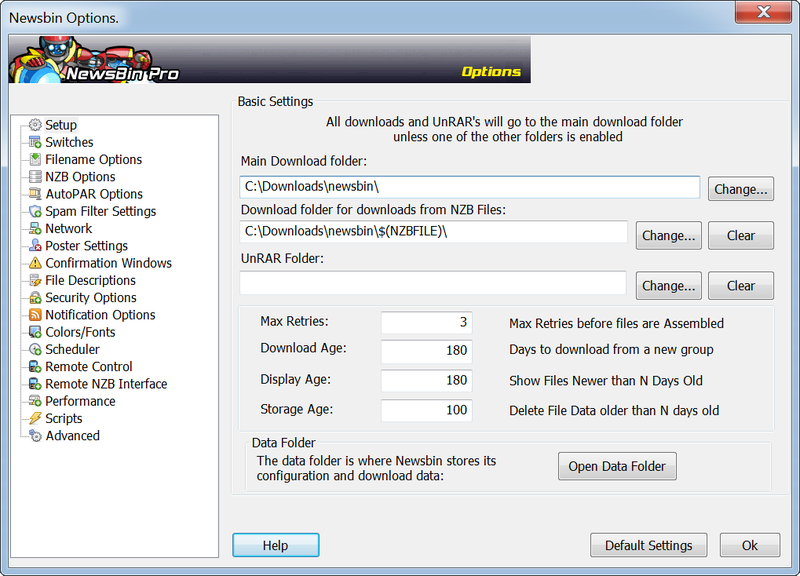 Much like any good downloader, Newsbin Pro has automation features. In order to accomplish this, an NZB needs to be given to the software. It can be one that you have downloaded from a website on your own or from an indexer. If using one that has been grabbed using a website, this can require signing up and sometimes also paying for an indexing service. What the software will do is periodically scan these folders to see if anything new has been placed into them. If so, Newsbin Pro can be setup to begin getting them automatically. This frame is where you can set this up. More often than not, files are uploaded to Usenet in parts and spread out across multiple threads. This is due to the fact that Usenet limits the size of individual posts, and sometimes due to an attempt to gain privacy. Newsbin Pro can automatically piece these parts back together again and then decompress them. If you, for whatever reason, want to tinker with how it is setup to go about that process, this is the section where you can do that.